Set in the beautiful Yorkshire Dales, I entered the Saturday Enduro - a race comprising of a 45km loop with 5 timed downhill stages. 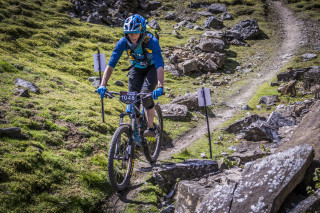 With 2500 meters of ascent and descent on natural rocky terrain and some amazing alpine style sections, this was not one for the faint hearted! Arriving in Reeth on Friday afternoon it was straight on the bike to check out a few of the stages before course practice finished for the day. First on the list was Stage 1… Now I was expecting things to be hard but this was even tougher than I expected - it was steep and super technical! Slightly daunted, I swallowed my nerves and headed over to Stage 5, this was still tricky but rode beautiful and left me feeling pretty nervous but excited for the big day. The next morning was mixture of tiny final bike adjustments and panicking over which colour top I should wear (when I am nervous I always faff over the little things!). I was the only women in my wave of riders, which was not too much of a surprise as out of the 2000 people racing over the weekend there were only 87 women - that’s 4%! Before I knew it I was off! The next few hours were a mixture of stunning climbs and exhilarating but slightly terrifying descents with a good measure of hilarious bike issues. In the first 5 minutes my team were one man down (mechanicals), then half way down Stage 1 I managed to take a fairly big fall narrowly avoiding a stone wall! By stage 2 there had been yet more mechanicals for the remainder of my team, leaving me to brave rest of the course on my own, unsure if the Grim Sweeper (an awesome tandem duo) had caught up with the others… Yet somehow it all came together we all managed to finish – I even managed to come 9th in my category!